West from Beaver Creek Resort Elk Lot along U.S. Highway 6 through Edwards to Wolcott, then North on CO Highway 131 to Colorado River Road continuing to Dotsero -- at the confluence of the Colorado and Eagle Rivers. There is a 20 mile section of well maintained dirt road that is watched by SAG vehicles on the Colorado River Road. 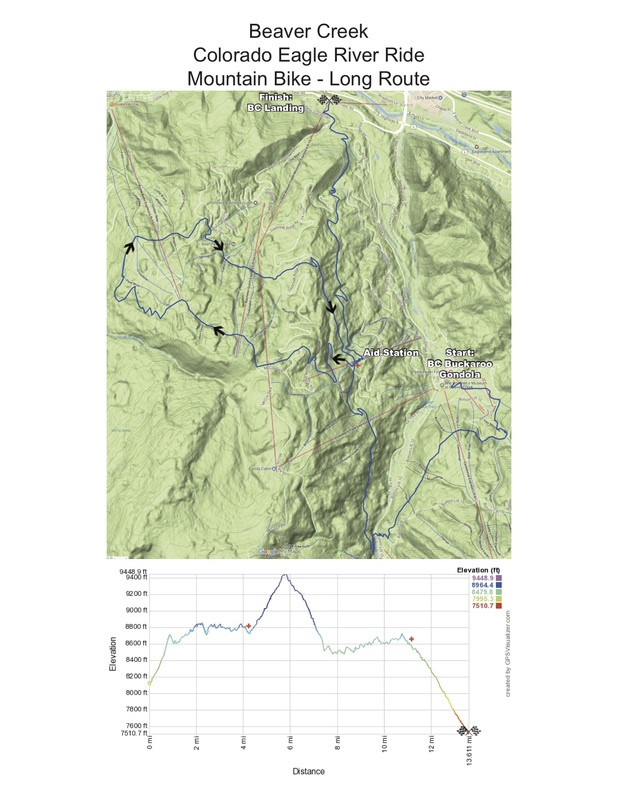 Riders then will head east on U.S. Highway 6 and follow the Eagle River back to the finish at Beaver Creek Resort Elk Lot. Rolling hills and moderate climbs make for a fun but challenging course. 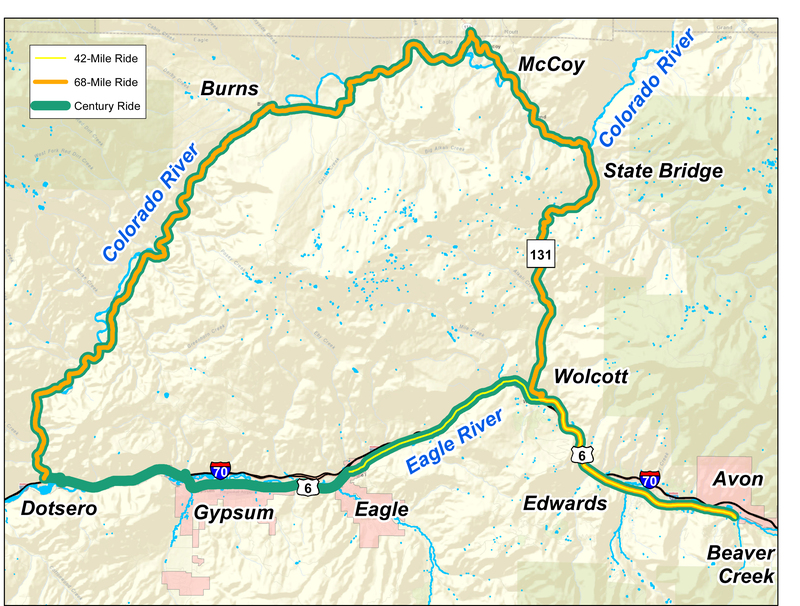 Ride West from Beaver Creek Resort Elk Lot along U.S. Highway 6 and follow the 100 mile route to Dotsero. There is a 20 mile section of well maintained dirt road that is watched by SAG vehicles of the Colorado River Road. Return to the Beaver Creek Resort Elk Lot using the provided shuttle service from the Dotsero aid station. Shuttles will leave regularly until the aid station closes at 3:00 p.m.
West from Beaver Creek Resort Elk Lot along U.S. Highway 6 following the Eagle River through Edwards and Wolcott to Eagle.There, riders can enjoy a break at the well-stocked aid station before returning to the finish. The final leg returns on easy rolling Highway 6 along the scenic Eagle River, ending at the Beaver Creek Resort Elk Lot. Perfect for the recreational rider. Four aid stations will be strategically located along the route --all with appropriate cycling food and plenty of water. Medical and mechanical support will be on hand as well. As always, riders should carry their own tubes, pumps and other basic repair items. Get ready to crank it for the kids on either the short or long course. 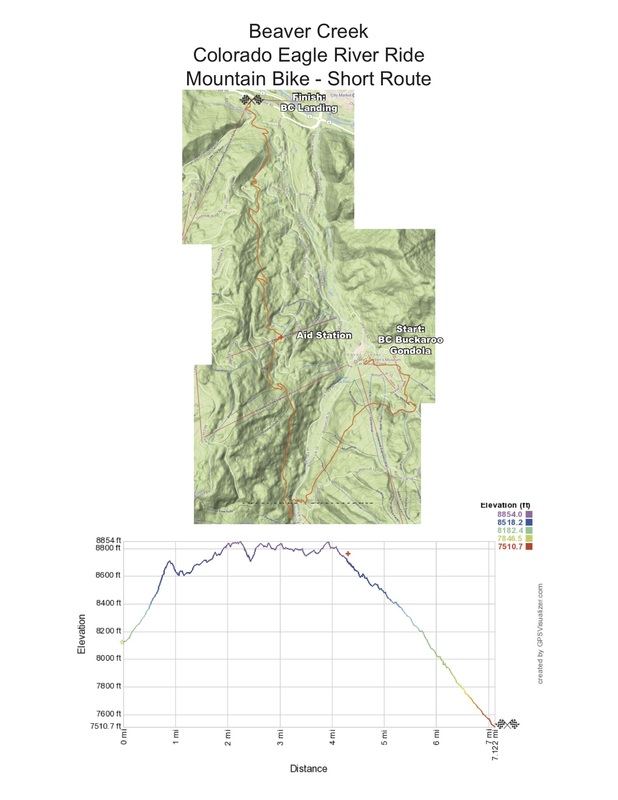 Both routes start from the heart of Beaver Creek Village, with the short course completing a loop on Beaver Creek Mountain traveling down, and long course traversing trails across Beaver Creek, Bachelor Gulch, and Arrowhead before making final descent down to Beaver Creek Landing. Course will be fully marked and there will be a fully-stocked aid station with bike mechanic on site. At the end of your ride, turn on Prater Road to cruise through the official finish line! At the Festival Finish enjoy live music, some hard-earned food and refreshments, and your commemorative Ride cup! AID STATION: There is a full aid station located at the convergence of Lost Buck, Village to Village and Elkhorn trails. It is denoted as a red cross on the attached course maps. The aid station is equipped with appropriate biking snacks, energy drinks, portable toilets and plenty of water. Riders must wear wristbands (supplied with registration) to obtain food at aid station.